Wedding dresses come in many different shapes, sizes, styles and designs but all have one thing in common; they are made to make the bride look and feel beautiful on her wedding day. For some women the perfect dress will break the mold completely, whereas others will desire a classic look. Whichever type of dress the bride decides upon it will be the most remembered aspect of her wedding; as such they can command a high price tag and often leave a rather sizable dent in the wedding funds. 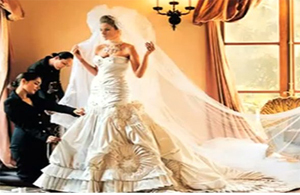 Brides from wealthy families often wore wedding dresses in expensive fabrics and rich colors and have been known to be overtly lavish, expensive and extremely grand. These dresses are unique and only the rich and famous can afford them. Not only do these dresses surpass all others in cost but they scream of luxury and class. The most luxurious elegant dresses and gowns are going to be expensive, however not all expensive wedding dresses are going to be luxurious. For a wedding dress to be luxurious it must both flaunt the wearer’s wealth but also be stylish and desirable. 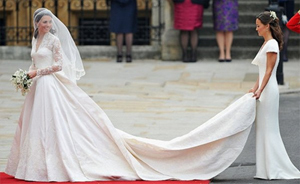 Currently the most famous wedding dress in the world; this is the dress that Kate Middleton famously wore on the day her and Prince William were married. It may not be the most expensive dress ever made but it is certainly not cheap coming in at a hefty $400,000 (£250,000). The dress combines tradition and modernity. Drawing classic influences from Victorian corsetry while the lace work was completed using an entirely modern technique. All of the lace work was completed by hand by the Royal School of Needlework and as such the quality of the dress is almost unsurpassed. Though the dress is an Alexander McQueen it was designed by Sarah Burton who was responsible for not only the design but also the sourcing of all of the materials. The Danasha Luxury Gown manages to flaunt extravagant wealth without being overly flashy about it. Its modern sleek design does not rely on or in fact need any gimmicks to make it stand out, any bride or even groom who saw this dress would immediately fall head over heels in love with it. Featuring 75 carats of hand-picked diamonds as well as 250 grams of 18 carat gold there is no doubt that this dress can only be afforded by the mega rich, setting them back a cool $1.5 million. This dress designed by Renee Strauss holds the record for the most expensive wedding dress ever created. There is no missing its 150 carats worth of high quality diamonds encrusted all over the dress. Surprisingly not made for a bride this dress is still available if you can afford its price tag of $12 million. The Christian Dior gown worn by Melania Knauss when she married billionaire Donald Trump may seem like it costs small change compared to the other dresses featured, however there is no denying it is a luxury dress only suitable for someone marrying one of the richest men in the world. 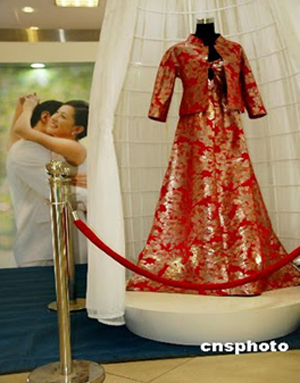 This Chinese dress not only stands out because of its vivid red colors but also because it is entirely made of platinum. This creation stands out amongst all other luxury dresses due to its bright colors and totally unique design. About the Author: Perl Watson is a freelance writer and blogger based in Worthing, UK. She loves writing on latest trends, fashion and lifestyle topics. She recommends Hitched for finding elegant dresses and gowns for your wedding.